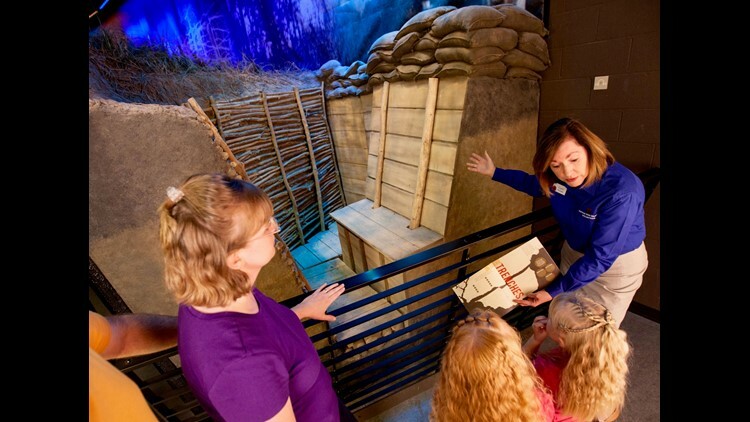 Learn how soldiers climbed “over the top” of their muddy, lice- and rat-infested trenches during offensives in the Great War at the National WWI Museum and Memorial. Exactly one hundred years ago, our soldiers were fighting the deadliest military battle America ever waged. This battle killed in action over 26,000 men, wounded an additional 95,000, and inflicted unimaginable terror, destruction and suffering that never ended for some. It was deadlier than the Battle of the Bulge, the invasion of Normandy and Battle of Okinawa in World War II. It killed more than three times the men in the battles of Gettysburg, Spotsylvania and Chickamauga combined. Sadly, many Americans cannot name this ghastly campaign nor the war in which it occurred: World War I’s colossal Battle of the Meuse-Argonne. The Meuse-Argonne, sometimes called the Meuse-Argonne Offensive or Battle of the Argonne Forest, lasted seven weeks in northeastern France involving 1.2 million “doughboy” soldiers fighting in the American Expeditionary Forces during the Great War. Our part in this final offensive helped bring about an armistice in the War to End All Wars at 11 a.m. on Nov. 11, 1918, a day we now observe as Veterans Day. The National WWI Museum and Memorial’s 217-foot Liberty Memorial tower and two winged sphinxes are located in downtown Kansas City, Missouri. 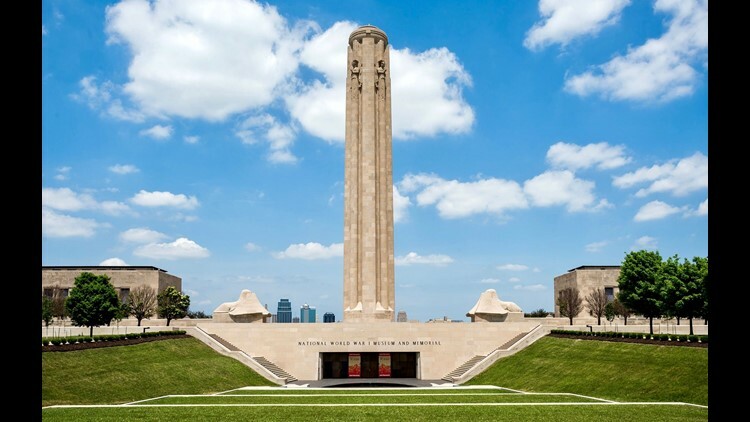 Only official WWI national memorial in the U.S.
Short of booking a lengthy trip to France, one of the best ways to understand the the first global war is to visit the National World War I Museum and Memorial in Kansas City, Missouri. “If you’ve heard about all the hoopla about the centennial of the Great War and want to learn more about it, this is the perfect place to be,” said John Milam, a software designer who lives nearby in Missouri. Milam works just a few miles from the museum and has visited so many times he’s lost count. “There is so much information to learn, so many period artifacts to see. I could go weekly and never tire of it,” he said. It’s both an intellectual and emotional experience for Milam, who’s researched several relatives in the war. The facility comprises two parts: an outdoor memorial and indoor museum that lies underneath. Outdoor is the 217-foot tall Liberty Memorial tower and two gigantic Assyrian-type sphinxes concealing their countenance with their wings. “Approaching from the south side, the twin sphinxes covering their faces send chills, knowing what they represent. ‘Memory’ facing east, hiding its face from the horrors of the European battlefields. ‘Future’ facing west, hiding its face from what is yet to be,” Milam said of the exterior. “It is incredible. Massive. Humbling. The world’s most comprehensive Great War collection lies in the American Midwest at the National WWI Museum and Memorial. Originally opened in 1921, the memorial is the only official national WWI memorial as yet. It received its national memorial designation from Congress in 2014. While no national WWI memorial exists on the National Mall in Washington with all of the other 20th century war memorials, there are plans for one at the site of run-down Pershing Park on Pennsylvania Avenue. However, progress has stalled at the controversial Pennsylvania Avenue site amid criticism from the World War One Memorial Foundation and others. Inside the museum in Kansas City, the vast collection is comprehensive, covering most of the combatant nations involved in the war. The current 80,000-square-foot, $102 million museum opened in 2006, two years after receiving its national museum designation. “Nowhere else in the world can an individual see the depth and breadth of a WWI collection that features objects and documents from virtually all of the participants,” said Mike Vietti of the National WWI Museum and Memorial. The exhibitions within the museum are designed to engage people of all ages and interests – whether knowledgeable about WWI or not. 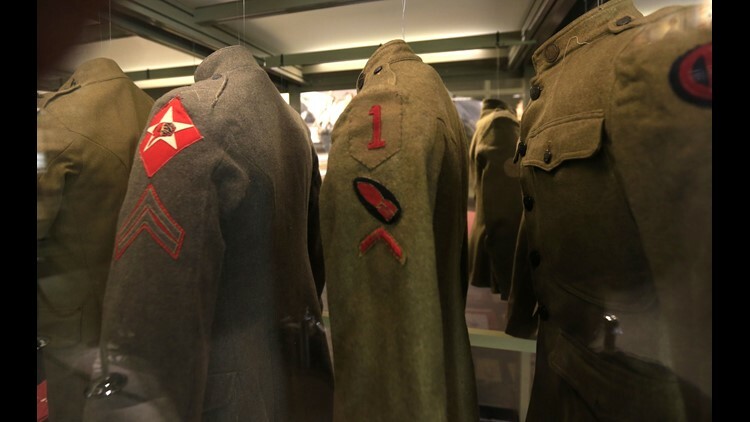 Uniforms hang on display at the National World War I Museum and Memorial in Kansas City, Mo. “There’s a chronological timeline for those who prefer to view information in a sequence, but there are also separate spaces where people can view items, documents, uniforms, weapons, personal objects and much, much more – objects that help in personalizing the experience of those who served and lived through the Great War,” he explained. Vietti said visitors shouldn’t miss the battle-scarred French Renault FT-17 tank – one of only three known in the world to have served in World War I – and the Pantheon de la Guerre, originally a gigantic painting now reduced to fragments. 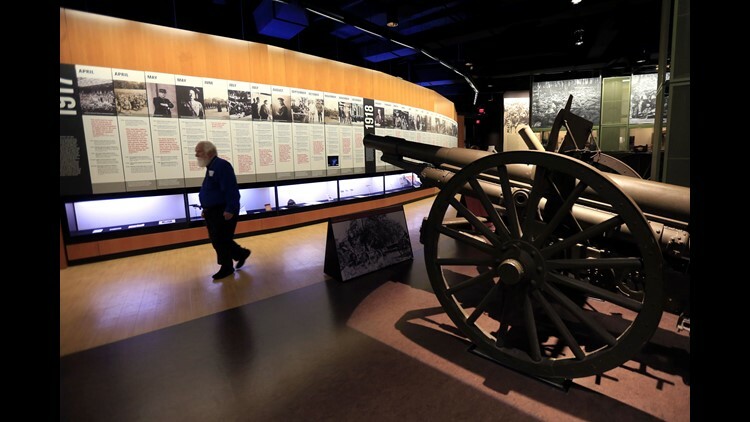 Milam said halfway through the circular-shaped museum, a video explains how the U.S. entered the war in a display that brings “no man’s land” (land that lay between opposing forces) to life. “The trench scenes, the no man’s land in the theater and the walk-through shell crater exhibit . . . these are not just photos. They re-created these environments,” he said. 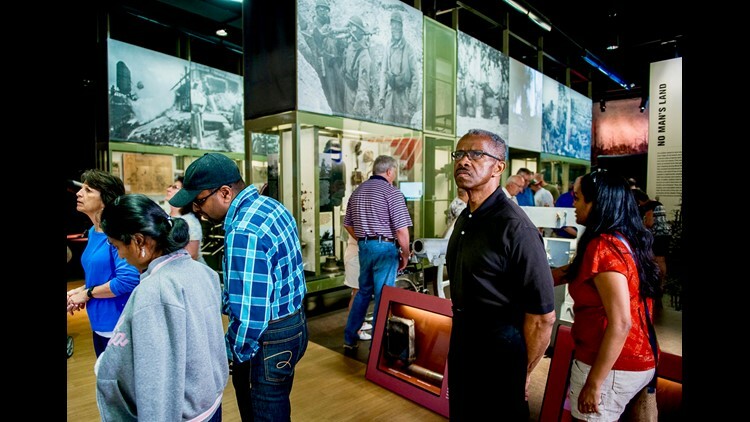 The National WWI Museum and Memorial is open Tuesday through Sunday; daily in the summer. Tickets range from $10 to $16, with members and children under 6 years admitted free. Active-duty military and family, veterans, teachers and convention attendees receive a discount. World War Wednesdays admission is $8. A docent walks past a French artillery piece at the National World War I Museum and Memorial in Kansas City on Feb. 16, 2017.